On Thursday afternoon, Krumm unveiled another sign—a massive billboard advertising a $25,000 reward for tips leading to the arrest of two people suspected in the death of her brother. “Our hope is that somebody will see the billboard and come forward with some information that will lead to the arrest and prosecution of those responsible for killing my brother,” said Krumm, addressing a press conference held on Candler Road in East Lake. 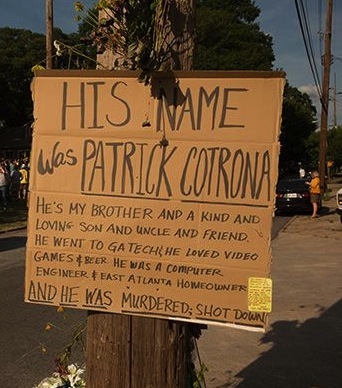 Cotrona was killed walking home with two friends from a bar in East Atlanta Village on May 25, 2013. A man approached the trio demanding money. While Cotrona was reaching for his wallet, the suspect shot him in the abdomen. Another person was shot in the leg, but survived the injury. After leads in the case led to dead ends, the Cotrona family decided to advertise the reward. Through an online fundraising campaign, they were able to secure enough money to buy space on seven billboards around East Atlanta. The billboards show the police sketches of the suspects. Atlanta Police Captain Paul Guerrucci said APD would immediately check into any tips that come in. Anyone with information on the case is asked to call Crime Stoppers at 404-577-8477.